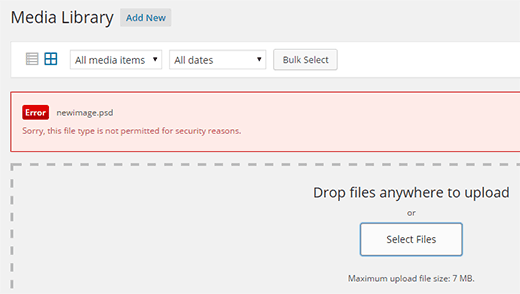 For better security, WordPress allows you to only upload the most commonly used file types. You can upload commonly used image formats, audio/video, and documents using the default media uploader. But if you wanted to upload a file type that is not allowed? In this article, we will show you how to add additional file types to be uploaded in WordPress. WordPress allows you to upload most common image files, audio/ video, PDF, Microsoft office and OpenOffice documents. 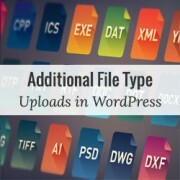 WordPress codex has a full list of allowed file types and extensions. Security is the main reason behind the limitation on file types that users can upload. However, this does not mean that users cannot change this. Using a tiny bit of code, you can add a new file type and extension to the WordPress. Notice that the file extension goes as the key in $mime_types associated array and the mime type goes as its value. In this example, svg file extension represents files with the mime type image/svg+xml. You can find out mime types of several common file extensions on this page. We hope this article helped you learn how to allow additional file types to be uploaded in WordPress. You may also want to take a look at how to increase maximum file upload size in WordPress. Please make blog on how to make download option in the wordpress. I hope you understand what I said.If some one click ‘download`. It will download. i have added the below code in functions.php but when i’m trying to upload ‘svg’ files,i’m getting the same error. Please help me. OMG! You saved me! I followed your instructions and I am now able to upload EPUB files to my form in Request Book Review page on my website. Thank you! Can you paste your code for epub please? I’m not to good with coding. 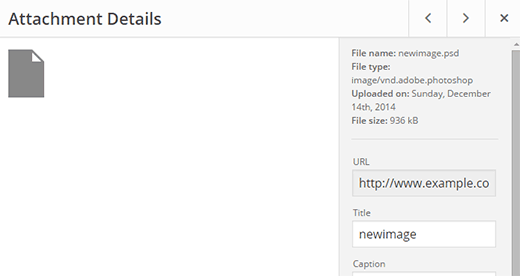 You can also setup WordPress to allow to upload all file types. This can be performed with the help of a WordPress constant “ALLOW_UNFILTERED_UPLOADS”. You can set the WordPress constant “ALLOW_UNFILTERED_UPLOADS” to true” in wp-config.php file of your WordPress install. The wp-config.php file can be found in the root directory of your WordPress install. Using your favorite editor (vi editor) open the wp-config.php file and add the following line somewhere in the file. You can also use File Manager to edit the WordPress configuration file. Don’t forget to save the config file after editing. The dangers of a method like this would be that you are allowing every file type to be uploaded to your site which removes some safety. I still cannot get csv uploads to work in 4.9.9 upwards of wordpress. Has anyone got a solution? Just adding the csv type to the list doesn’t seem to help. Is csv explicitly banned in the core somewhere. Can you tell me what I would add to the file to be able to upload those 2 file types? You cannot upload it by default. You will need to allow .exe file types first. Please see the instructions in the above article. In the page several common file extension .emb is not included. Please Give me code to upload .emb type of files. Kevin’s code for KML/KMZ files worked perfectly for me. Thanks!!! I did what the instructions say and I still can’t upload .ogv files. Does anybody know why it doesn’t work? This worked to allow me to initiate the upload of a dmg file, but when it says the is 100% complete, it doesn’t show up in the Media files, and it isn’t in the wp-content folder either, so I’m not sure why… any ideas? How would I go about editing the snippet for android .apk files? I want to upload .gifv file extension image. For that I have added the following code in functtions.php file. File is uploaded successfully but its not playing. Please help. Doing this example I was able to now allow upload of AI file with custom Icon for the file type. I would like to change the icon used for PDF to a PDF icon. Can this be done? i m facing same issue still, i added apk extention from function file. but it shows still same issue. Thanks for this article, I used it today! I have a question. I had to allow .sql file types to be uploaded to wordpress, in order to upload some of my scripts that I would like to share. The problem is, if I put the script in a link, when I click on the link, the script downloads automatically, instead of opening in a new window. When can I change the behavior? Also after the file is uploaded it says it is SQL type. So, it would be nice if we knew where to add the code?????????????????? I’ll try at the bottom and see what happens. Worked. For the people wondering. I just scrolled to the end of that page and pasted the code in there. If you copied and pasted the code up there, don’t be like me and leave the numbers. Just erase the numbers. All I did was copy and past the code up there and changed the file extension and the… other part. Worked like a charm. Oh, the finctions.php is in appearance -> Editor -> On the right side of that page, Theme Functions (functions.php). Just scroll to the end of that page and add your code there. Adding the code looks pretty easy but it is not clear where I should add the code. Where do I go from my dashboard to add it? I’m using WordPress 4.3.1. I managed to get the different file types (.IES and .LDT files) to upload ok following your advise above but unfortunately they do not download as files, but rather as code….any tips on how to fix this issue?. This is the code i used in the theme-function.php file..
How do you get the file type’s small icon (the file type logo) to load automatically where it will be positioned next to the name of the file (which is a link)? I’m guessing that’s CSS? Get 20% off on ShowThemes beautiful WordPress themes for event websites.